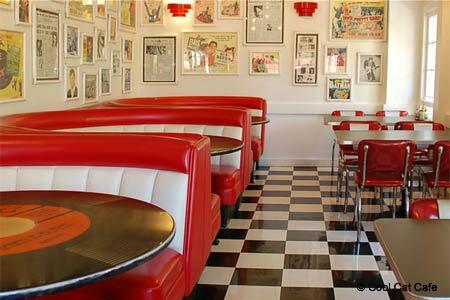 An open-air 1950’s American diner-themed restaurant offering good burgers, view and value. : If you’re craving simple and satisfying comfort food, look no further. Cool Cat Café supplies that, and so much more, offering fresh ingredients, affordable prices and great views of the ocean, Lahaina Harbor and Front Street. If burgers are your thing, this eatery has some of the best---and the largest selection---on the island. We recommend the Duke, a formidable bacon cheeseburger with fried onion rings and tangy sweet barbecue sauce. There are also fish and chicken sandwiches, daily local seafood entrées and steaks, as well as old-fashioned fountain shakes and malts. Live contemporary Hawaiian music and light rock is offered daily in the open-air, casual dining area overlooking Lahaina’s historic Banyan Tree Park.